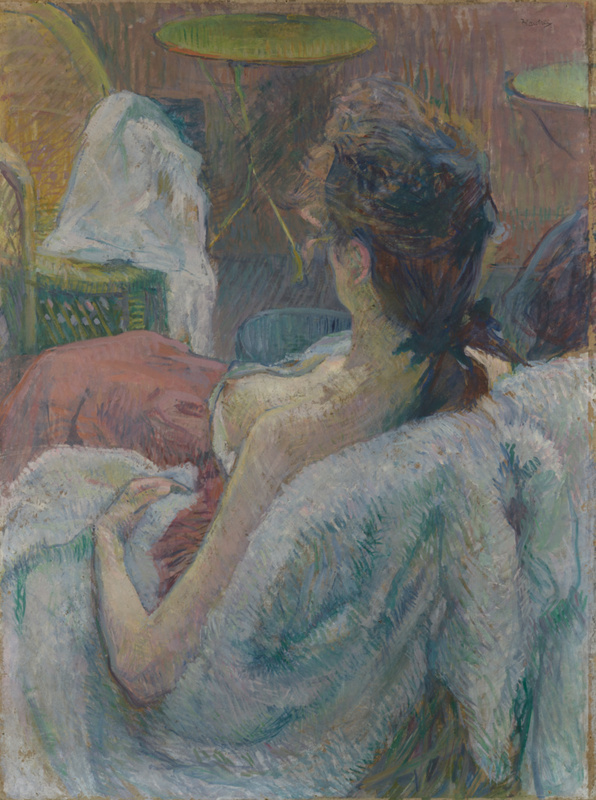 Probably painted from life, a semi-clad woman rests with her face hidden and her breast and shoulders exposed. This viewpoint--with the woman observed from above and behind--emphasizes her submissiveness and the spectator's control. The row of small tables and chairs implies a less-than-private setting, perhaps a cafe or brothel. Henri de Toulouse-Lautrec explored the worlds of the theater, the cabaret, and the brothel--what the poet Charles Baudelaire called "the pleasures of Parisian life." Edgar Degas's series of pastel bathers, which were exhibited at the eighth Impressionist exhibition in spring 1886, may have inspired this particular subject and unusual angle of view. To quickly capture the scene, Toulouse-Lautrec used tempera or casein, both quick-drying, opaque media that emphasize individual strokes rather than smooth modeling. The layered, linear strokes of pastel colors impose a common texture on the picture's various elements: skin, hair, cloth, wood, and wicker. Acquavella Galleries, Inc. (New York, New York), sold to the J. Paul Getty Museum, 1984. Nebbia, Ugo. Toulouse-Lautrec. Cesare Foligno, trans. (Milan: Uffici Press, n.d.), pp. 20-21, no. 7, ill.
Alexandre, Arsène. "Exposition rétrospective de l'oeuvre de H. Toulouse-Lautrec (1864-1901)." Les Arts, no. 152 (August 1914), p. 13. L'Art moderne et quelques aspects de l'art d'autrefois [...] la collection privée de MM. J. & G. Bernheim-Jeune. 2 vols. (Paris: Bernheim-Jeune, 1919), vol. 2, p. 97, fig. 155. Joyant, Maurice. Henri de Toulouse-Lautrec, 1864-1901, Peintre (Paris: H. Floury, 1926), p. 292. Exposition H. de Toulouse-Lautrec, exh. cat. (Paris: Musée des arts Décoratifs, 1931), p. 50, no. 154bis. Mac Orlan, Pierre. Anciens et Modernes: Toulouse-Lautrec, Peintre de la lumière froide (Paris: Librairie Floury, 1934), p. 167, ill.
Lassaigne, Jacques. Toulouse Lautrec (Paris: Éditions Hypérion, 1939), pp. 137, 167, ill.
Dortu, M. G., ed. Toulouse-Lautrec (1864-1901), exh. cat. (Brussels: Palais des Beaux-Arts, with Editions de la Connaissance, S. A., 1947), unpaginated, no. 34a. Florisoone, Michel, M. G. Dortu, and Édouard Julien. "Toulouse Lautrec." Art et Style 19 (1951), unpaginated, ill.
Florisoone, Michel, and M. G. Dortu, eds. Toulouse-Lautrec: Exposition en l'honneur du cinquantième Anniversaire de sa mort, exh. cat. (Paris: Orangerie des Tuileries, with Éditions des Musées Nationaux, 1951), p. 24, no. 66. Dortu, M. G. Toulouse Lautrec (Paris: Les Éditions du Chêne, 1952), pp. 9, 11, no. 53, ill.
Jourdain, Francis, and Jean Adhémar. T-Lautrec (Paris: Éditions Pierre Tisné, 1952), p. 128, no. 113, ill.
Panorama de l'art contemporain dans les musées et collections belges / Panorama van hedendaagse kunst uit belgische musea en verzamelingen, exh. cat. (Brussels: Editions de la Connaissance S.A., with Palais des Beaux-Arts, 1953), unpaginated, no. 16, ill.
Dortu, M. G., Madeleine Grillaert, and Jean Adhémar. Toulouse-Lautrec en Belgique (Paris: Quatre Chemins, 1955), no. 27, ill.
Julien, Edouard. Toulouse-Lautrec (New York: Crown Publishers Inc., 1959), p. 59. Caproni, Giorgio, and G. M. Sugana. L'opera completa di Toulouse-Lautrec (Milan: Rizzoli Editore, 1969), no. 442. Dortu, M. G. Toulouse-Lautrec et son oeuvre (New York: Collectors Editions, 1971), pp. 376, 377, no. P.611, ill.
Stuckey, Charles F., and Naomi E. Maurer, eds. Toulouse-Lautrec: Paintings, exh. cat. (Chicago: Art Institute of Chicago, 1979), p. 177, under no. 49, fig. 1. Murray, Gale Barbara. "Henri de Toulouse-Lautrec: A Checklist of Revised Dates, 1878-1891." Gazette des Beaux-Arts, 6th ser., 95, no. 1333 (February 1980), p. 89. Sotheby's, London. Important Impressionist and Modern Paintings and Sculpture. March 31, 1982, lot 63, ill.
Robinson, Susan Barnes, ed. The French Impressionists in Southern California: Paintings, Sculptures and Prints in Public Collections; A Guidebook and Catalogue (Los Angeles: Loyola Marymount University, 1984), p. 78. Fredericksen, Burton B. "Recent Acquisitions of Paintings: The J. Paul Getty Museum." Burlington Magazine 127, no. 985 (April 1985), p. 268. "Acquisitions/1984." The J. Paul Getty Museum Journal 13 (1985), p. 213, no. 147, ill.
Fredericksen, Burton B. Masterpieces of Painting in the J. Paul Getty Museum. Rev. ed. (Malibu: J. Paul Getty Museum, 1988), unpaginated, no. 46, ill.
Murray, Gale B. Toulouse-Lautrec: The Formative Years 1878-1891 (Oxford: Clarendon Press, 1991), p. 251, app. A.
Thomson, Richard, ed. Toulouse-Lautrec, exh. cat. (London: Hayward Gallery, 1991), p. 412, under no. 128, fig. a.
Devynck, Danièle. Toulouse-Lautrec (Paris: Chêne, 1992), p. 154, fig. 11. Felbinger, Udo. Henri de Toulouse-Lautrec: Life and Work (Cologne: Könemann, 1999), p. 56, ill.
Cabanne, Pierre. Henri de Toulouse-Lautrec, le peintre de la vie moderne (Paris: Éditions Pierre Terrail, 2003), p. 164. Thomson, Richard. The Troubled Republic: Visual Culture and Social Debate in France, 1889-1900 (New Haven and London: Yale University Press, 2004), pp. 43-44, fig. 34.